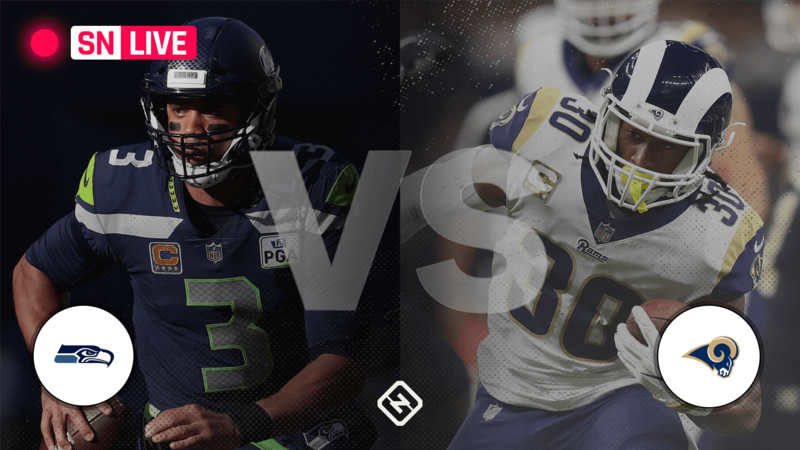 Two NFC West rivals meet Sunday as the Seahawks head to Los Angeles to take on the Rams. LA remains in the upper echelon of the NFC despite its loss to the Saints last week. The Rams will look to bounce back against a middling Seahawks team. Offense has been the the key to the Rams’ success this season. Entering Week 10, the Los Angeles offense ranks third in points per game (33.2), first in yards per game (447.1) and first in rushing yards per game (144.3). Sporting News is providing live updates and highlights from the game below. 6:24 p.m.: TOUCHDOWN SEAHAWKS. Wilson finds Tyler Lockett for the 23-yard touchdown and puts Seattle back out in front. Seahawks leads 21-20. 6:17 p.m.: Seahawks with a nice drive here, but it falls short after they fail to convert on third-and-11. However, an unsportsmanlike conduct penalty on Dante Fowler Jr. keeps the Seahawks’ drive alive. 6:07 p.m.: FIELD GOAL RAMS. LA starts off the half on a good note with a 56-yard drive. Zuerlein then connects on a 37-yard field goal to extend the lead. Rams lead 20-14. 5:59 p.m.: Rams will start the second half with the ball at their own 25-yard line after the touchback. 5:45 p.m.: Seahawks punt after the Rams get a stop on third down. LA takes over with 17 seconds to go and it’ll just run out the clock. 5:33 p.m.: TOUCHDOWN RAMS. Gurley runs it in from 17 yards out to give the Rams their first lead of the game. PAT is good. Rams lead 17-14. 5:29 p.m.: A couple of nice runs by Todd Gurley have LA in Seattle territory with just over five minutes until halftime. 5:23 p.m.: Wilson is sacked by Donald again on third down and Seattle has to punt it away. AD with his second sack of the game! ? 5:17 p.m.: LA faces a third-and-long on the ensuing drive when Quinton Jefferson sacks Goff for a loss of seven yards. LA’s Blake Countess is flagged for unnecessary roughness on the punt and Seattle will get the ball at its own 31. 5:07 p.m.: Wilson gets swallowed up by Aaron Donald for a loss of eight yards. Seattle punts it away to LA who’ll start at its own 20. 5:02 p.m.: FIELD GOAL RAMS. Greg Zuerlein drills a 35-yard field goal after a 58-yard drive. Seahawks lead 14-10. 4:59 p.m.: Rams are at the Seattle 17-yard line to start the second quarter. 4:57 p.m.: Defense seems to be optional today. Rams in the midst of a 5-play, 56-yard drive right now while the Seahawks have scored on both of their drives. 4:50 p.m.: TOUCHDOWN SEAHAWKS. Rashaad Penny runs it in from 18 yards out to give Seattle the lead back. He also had a 38-yard run two plays earlier to set the Seahawks up in the red zone. Seahawks lead 14-7. [email protected] finds the end zone for the @seahawks! 4:34 p.m.: TOUCHDOWN SEAHAWKS. Russell Wilson caps of a 75-yard drive with an 8-yard touchdown pass to Nick Vannett. PAT is good. Seahawks lead 7-0. [email protected] to @N_Vannett81 for the @Seahawks TD! 4:26 p.m.: Seahawks receive the opening kickoff and will start at their own 25-yard line. Seahawks Starting RB Carson, RG Fluker Inactive for #SEAvsLA.